The market gets what the market wants and, for the first quarter of 2013, the market has wanted relatively (as compared to treasuries) high yield ‘defensives.’ I use inverted commas because when looking at a stock like McDonald’s Corporation (NYSE:MCD) I’m not convinced it is as attractive as the market thinks it is. Furthermore, if you buy a stock because it is fashionable then you better be prepared for any disappointment should fashion change. It’s been a tough year for the fast food sector, and McDonald’s Corporation (NYSE:MCD) delivered another quarter of disappointing same store sales growth. Moreover, it described the informal eating out industry as being flat or declining in many parts of the world. So where did it all go wrong? Wasn’t this supposed to be the great defensive stock that proved itself so well in the last recession? My take on this is that the 2008-09 recession certainly resulted in a significant amount of global unemployment and income insecurity, which fed through into consumers trading down and adjusting their behavior by dining out in cheaper outlets. Such conditions played perfectly into the hands of companies like McDonald’s Corporation (NYSE:MCD) and Yum! Brands, Inc. (NYSE:YUM). In addition they had growth opportunities in expansion into China. 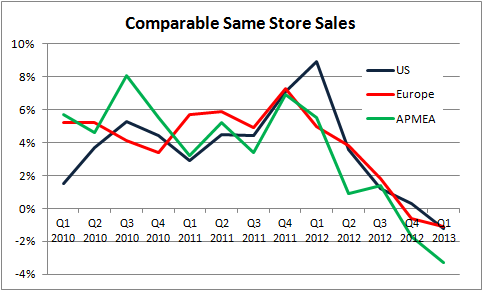 Fast forward into 2012 and the trading down has run its course and suddenly comparables are getting a lot harder. The easy growth has gone and the challenges are building. Sales growth from China is slowing, and McDonald’s Corporation (NYSE:MCD) is having problems adjusting its menu to deal with the slowdown in Europe. I discussed some of these issues at the start of the year. A look at its global comparable sales growth for the last few years. While recognizing that the US market is tough, McDonald’s Corporation (NYSE:MCD) spent a lot of time trying to convince investors that it was gaining market share in the US. The idea is that the key to its long term growth would be the retention of market share and not necessarily margin or cash flow growth. It’s hard not to think that this is going to have an effect on Yum! 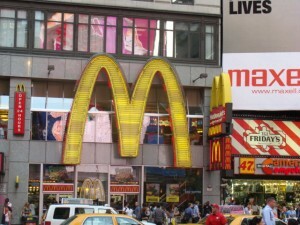 Brands, Inc. (NYSE:YUM) and Burger King Holdings, Inc. (NYSE:BKW) in the US. Chipotle Mexican Grill, Inc. (CMG): Is Now the Time to Take a Bite? Starbucks Corporation (SBUX): Should You Buy the Coffee King? Buffalo Wild Wings (BWLD): Five Reasons This $90 Stock Is Heading to $120 Johnson & Johnson (JNJ), The Procter & Gamble Company (PG): How To... International Business Machines Corp. (IBM), McDonald’s Corporation (... Can Chipotle Mexican Grill, Inc. (CMG) Keep Climbing This Year?